ÎLE SAINT-BERNARD — And there we walked, through dangers untold and hardships unnumbered: poison ivy, mosquitoes and the sort of scenery that can stop your heart with its pretty. We fought our way here to the lookout beyond the covered bridge to tire out the child that stole our energy, for our will is as strong as nature and our kingdom is awfully lovely. Melani discovered this hidden gem just off the island of Montreal when she worked at a retreat held at the neighbouring Manoir d’Youville in early spring. Though she’d love to take credit for discovering Île Saint-Bernard, this was Mohawk land first, expropriated by Charles LeMoyne in the 17th century and taken over by the Grey Nuns nearly a century later. The nuns sold it back to Châteauguay in 2011. When hiking, we make a lot of noise, as you know. My allergies can make me sneezy and the stroller rumbles over loose rock and Jilly … well, she’s 2½, so quiet reflection isn’t high on her priority list. None of that matters here. The wildlife are so comfortable in their surroundings, so sure in the fact that we won’t shoot them with anything more powerful than a Nikon, that they pretty much just hang out and pretend we aren’t there. We saw dozens of deer, mostly near the entrance and generally in small groups, a few “I don’t give a crap” raccoons, and scores of daredevil frogs that hopped onto the path from the tall grass and marshland. We saw a muskrat in the pond near the turtles, surrounded by fingernail-size lilypads. There was evidence of beavers on trees every few feet. There are hundreds of species of birds, most of which I can’t name, but some I can, like red-winged blackbirds, egrets, herons, robins and chickadees that will light on your hand to eat sunflower seeds. And the babies! 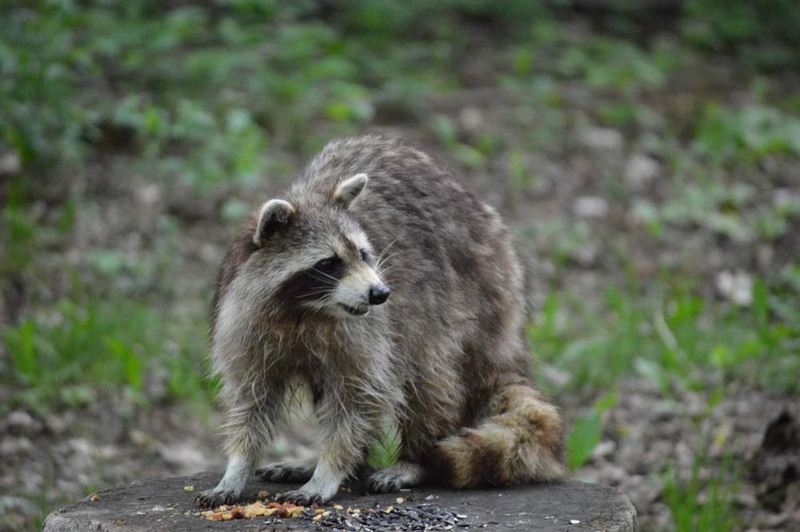 For every day of spring there is another baby, and the wildlife aren’t shy about showing them off. 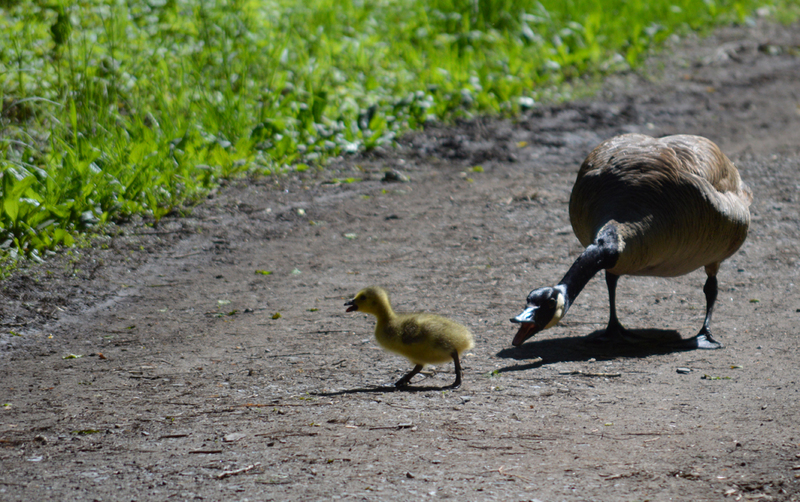 Several humans stopped and waited during one visit as a goose herded her goslings across the path. It’s hard to keep that many young ones under control, and it took her quite some time to get them all safely across. She ignored the constant click-click-flash of the paparazzi. There were ducklings, too, and a fawn that leaped against the grassy horizon just before sunset, trying desperately with long gangly legs to keep up with her graceful mother. Our own baby animal squealed with delight and here, unlike the many other parks we have visited, no one appeared startled and apt to flee when her happy yell split the air. Le Refuge faunique Marguerite-D’Youville gets four stroller wheels (out of the elusive five), no contest. The paths are wide and clearly marked (a little bumpy on the grassy bits if you’re driving a stroller) and offer an 8-kilometre tour of this fascinating island of ecosystems. It is about 30 kilometres from Montreal, just across the Mercier Bridge on the outskirts of Châteauguay. Admission is $4 per visit, or $20 for an annual pass. The sanctuary offers several kinds of education programs. People who come here clearly respect the reserve and leave no traces of themselves for deer to slip on or ducks to choke on. Carry in, carry out, and thanks for the adventure. 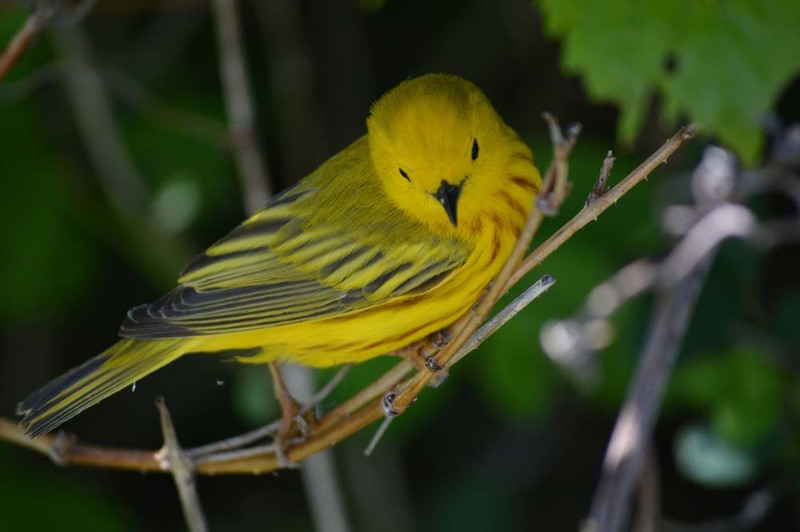 A round of applause for Sandy, who tells me this is a yellow warbler. Previous Long Island mystery: Who is Catherine M. Walsh?